Preheat the oven to 200°C, gas mark 6. Sprinkle a work surface lightly with flour and place the pastry in the centre. Take a lightly floured rolling pin and roll out the pastry, give it a quarter turn and roll it again. Continue in this way until the pastry is about 3mm thick. Cut out 12 large pastry discs using a 9cm fluted cutter. Line a bun tin with the discs. Prick each base with a fork and line with a small square of greaseproof paper. Add a few baking beans, then blind bake for 5-8 minutes until just cooked. Remove the baking beans and paper, press the pastry down in the centre if necessary and return to the oven for 1-2 minutes. 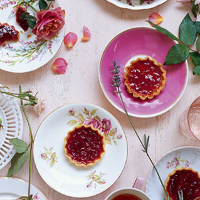 Using a teaspoon, spoon strawberry conserve into the centre of each tart. Return to the oven for 5-8 minutes. Transfer onto a cooling rack and allow to cool slightly – they’re best served just warm.